From January 7-31, Food+Tech Connect and The Future Market are hosting Biodiversity: The Intersection of Taste & Sustainability, an editorial series featuring interviews with over 45 leading food industry CEOs, executives, farmers, investors and researchers on the role of biodiversity in the food industry. See the full list of participants and read about why biodiversity in food is important here. We are also producing a biodiversity exhibit at The Winter Fancy Food Show, so please stop by to say hello. 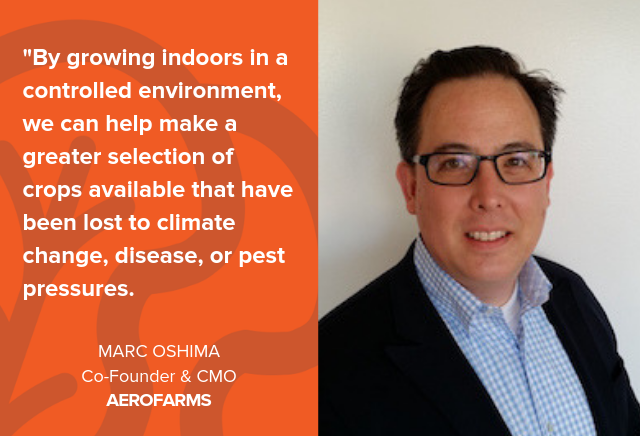 Below, I speak with AeroFarms co-founder and CMO Marc Oshima about how the indoor agriculture company is using growing technologies, data science, machine vision, machine learning and IoT technologies to grow a diverse variety of crops. 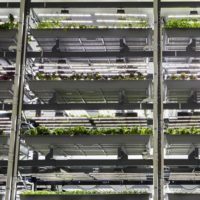 Using their patented indoor vertical farming technology, Aerofarms has grown over 700 different crops, including 250 different leafy greens, by replicating their ideal environment. 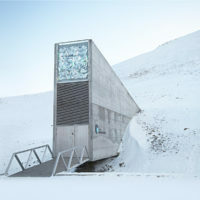 By growing in this kind of controlled environment, AeroFarms believes it can grow crops that have been lost to climate change, disease and pests. Marc Oshima: The world has lost a third of its arable land in the last 40 years. Seventy percent of our fresh water is going to agriculture and 70 percent of the pollution is coming from agriculture, creating dead zones in our waterways, contributing to a greater biodiversity loss. AeroFarms is fundamentally focused on increasing our biodiversity by championing new growing technologies that use less than 1 percent of the land and 95 percent less water vs.traditional field farming, while ensuring that our plants get all of the macro and micro nutrients they need all year round. We also are able to farm using zero pesticides that have been known to create imbalances in our eco-systems. Ultimately, AeroFarms is focused on preserving biodiversity to create a broader range of nutrient-dense products that taste great and are for the betterment of humanity. We have grown over 700 different varieties across different types of crops. Thanks to our controlled environment growing system we are able to grow unique, heirloom varieties that may be challenging, or cost intensive for field farmers. Due to today’s mass-scale monocropping typically found with our traditional field-farming agricultural paradigm, only a tiny fraction of leafy greens varieties are cultivated from the vast, rich set of options available. By providing consumers with unique options, we are able to drive trial and create a more diversified and unique food offering and celebrate broader cultural and regional cuisines. MO: At AeroFarms, we think about biodiversity in terms of number of crops and number of varieties of a crop but also resiliency. By growing indoors in a controlled environment, we can help make a greater selection of crops available that have been lost to climate change, disease, or pest pressures. DG: How does your organization define and think about biodiversity? What does an ideal biodiverse food system look like? How do you measure biodiversity, and when will we know when we’ve arrived at a “good” level of biodiversity? MO: We think of biodiversity in terms of diversity of crops as well as diversity within crops. For leafy greens, we have grown hundreds of varieties to date with hundreds more in the queue. Not only does this highlight our scope of capabilities, but also presents an exciting path for the future of agriculture and plant science – the ability to locally grow varieties from all over the world, anywhere, anytime. Our environmentally-controlled indoor farms can grow all year round independent of climate and weather events. This means we don’t have to worry about frost or crop protection, and can grow any crop by replicating their ideal environment in our patented indoor vertical farming technology. Our team is comprised of a diverse set of skill-sets: we are a group of full-stack, world-class agriculture experts fundamentally changing the way plants are understood and food is grown. At AeroFarms, horticulture intersects with engineering, food safety, data science, and nutrition, giving us the unique capability to understand plant biology in a way that has never been understood. We utilize and have developed cutting-edge approaches to machine vision, machine learning and IoT integration, bringing agriculture into the future at a rapid pace. From last year to this year, we have grown over 500 million plants alone, and more importantly we are able to harvest not just the plants but also the insights to ensure safe, high quality plants all year round, and in turn greater biodiversity. Ultimately, we think that a key goal of biodiversity relates to nutrient density and the health and wellness of our communities. If we can optimize a single plant to deliver a wider array of nutrients, we are on a better path to meet our future needs. MO: Since we began this journey in 2004, we have grown hundreds of unique varieties of leafy greens alone in addition to dozens of other crops. We are collaborating with top chefs and buyers to bring distinct offerings to market. As world experts in growing from seed to package and technologists, we have built a fully controlled farming approach that has enabled us to translate hundreds of millions of plants into billions of data points to inform optimal growing and quality. Using innovations in data science and plant biology such as machine vision, machine learning and AI, we have also successfully increased the number of crop cycles this year alone by double digit gains. These improvements and innovations are beneficial for our customers, our consumers, our bottom line, and exciting for our shareholders and stakeholders. Over the last year we have continued to work passionately and intensely building and optimizing environmentally responsible, indoor vertical farms to grow the most nutrient-dense and delicious local leafy greens using plant science and data science as our tools. In addition to growing and selling our leafy greens, we are continuing our work on major innovations in plant science and technology. This year we have been collecting data on our project with the Foundation for Food & Agriculture Research (FFAR), a nonprofit organization established through bipartisan congressional support in the 2014 Farm Bill, on a public-private research partnership to understand the sensory and nutrition characteristics leafy greens inside and out for the benefit of agriculture overall including both urban and rural farmers. In addition, we have partnered with major players such as Dell Technologies on projects including machine learning and IoT integration, bringing agriculture into the future at a rapid pace. DG: What is the business case for biodiverse indoor agriculture? MO: Introducing interesting new varieties to the marketplace has tremendous business value and promotes biodiversity. Consumers are looking for interesting new products to try and value companies that are constantly innovating. Investing in new varieties also opens up the possibility of discovering products that have characteristics that consumers value, such as nutrient density, flavor, shape, color, spice, etc. and can help companies both stay on-trend and drive trends. Retailers are very committed to packaged salads to differentiate on their fresh offering and are interested in expanding this category. Additionally, packaged salads are a higher margin item for them and retailers are excited to support further. MO: We need to change our system of incentivizing farmers to grow certain crops and allow a free market and ultimately the consumer to drive what crops are grown and brought to market. We also think that that more money should be invested into R&D to be able to grow safely more diverse products that have key desired characteristics – more nutrient density, more flavor, and greater safety. We also see opportunities to increase efforts to preserve heirloom seeds and to conduct more research on seed genetics of heirloom varieties. MO: Funding for research is a big challenge, as is introducing and marketing unknown varieties into the marketplace. 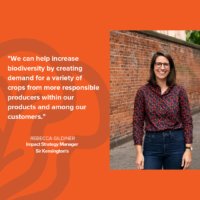 We are doing in-depth research with FFAR to keep biodiversity at the top of our priority list, and working closely with consumers and customers on product feedback of new and interesting varieties that are also well accepted by the marketplace. DG: How might we get more indoor ag farms to invest in biodiverse agriculture? MO: Indoor farms can be leaders in driving biodiversity commercially. In order to do this more quickly, incentives could be provided to accelerate research and development efforts by both the public and private sectors. The value of what indoor farms can do goes far beyond simply growing food. Indoor farms can be real drivers of innovation and key for the preservation and promotion of crop biodiversity globally. MO: It is all about access in order to have true impact. We envision a world where every supermarket has a fresh department including hundreds of varieties of each kind of product celebrating biodiversity that is as equally varied as our community. Co-Founder and Chief Marketing Officer of AeroFarms, a leading clean-technology company that builds and operates responsible, state-of-the-art indoor vertical farms around the world, helping transform agriculture. A Certified B Corporation, AeroFarms has been recognized by Fast Company as one of the World’s Most Innovative Companies for Food and by Inc. as one of the Top 25 Disruptive Companies. 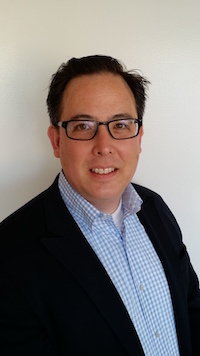 An award-winning marketer with an extensive background in retail, branding, and media, Marc is also passionate about increasing access to healthy food and has led the marketing for major food retailers. With his B.A. from Columbia College and M.B.A. from Columbia Business School, Marc is also Board Co-Chair of Chefs Collaborative, a 25 year old non-profit improving our sustainable food systems, and a member of the United Fresh Produce Marketing & Merchandising Council.